The leaves are turning, the air is crisp and the jumpers are out- well it must be AUTUMN! Autumn is definitely my favourite season where I also think it’s about the right time to ditch your summer hair into a new refreshed look. 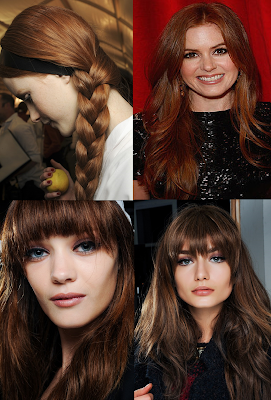 This year auburn/chocolate brown is in, and ombre is out, so let’s take a look into some of those Autumn shades. After colouring wait 24-48 hours to lock it in further. Cold water helps seal the cuticle of the hair whereas warm open the cuticle. Try rinsing your hair off in cold water. Use a glaze (ie: serums) to keep your red look shiny. Apply natural ingredients such as carrot and beetroot juice onto damp hair then (weather permitting) sit in the sun for an hour. If you are going light blonde to auburn, you may need need to take a few trips to the salon to get the desired deep auburn look. If not, rock a lighter strawberry blonde shade. So today I went to Escape Hair Salon, Calne, and got my red/chocolate brown shade and I love it! Credits: Kiera at Escape Beauty Salon, Calne, England. What will your hair colour be this Autumn?